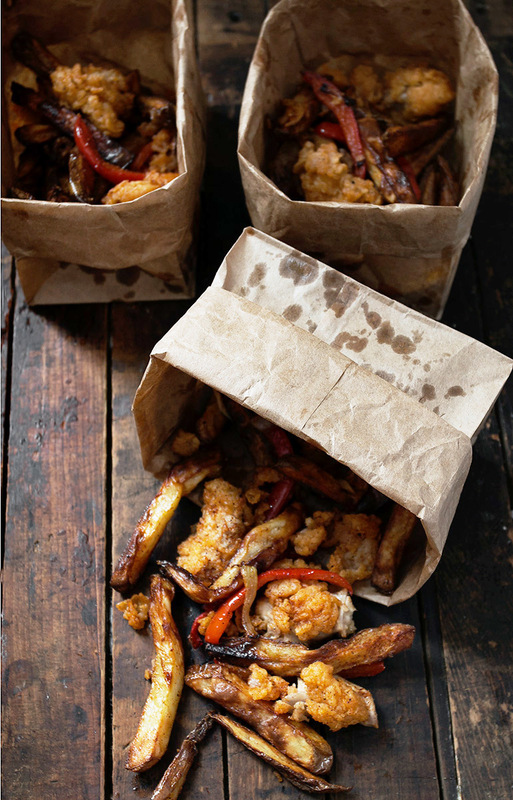 My version of Ireland’s favourite take-away, this Irish Spice Bag is a wonderful concoction of crispy fries, with spicy fried chicken bits and some fried onions and peppers thrown in. All tossed in a spicy, salty mixture. St. Patrick’s Day is the day we all get to be Irish for a day! And if we were Irish for a day, in Ireland, chances are very good that we might pick up a spice bag on the way home after a pint or two at the pub. 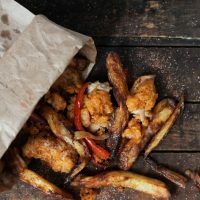 Yes, the Irish Spice Bag is a recent phenomenon, but well on it’s way to become iconic Irish fare. 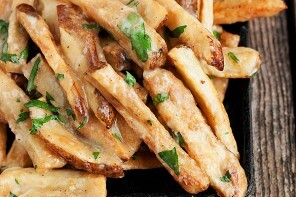 You can make your fries any way you like – fry, bake or air fry, as I did (my favourite fry preparation tool!). If you don’t have or want to use buttermilk, you can substitute regular milk in the marinade. Maybe throw a 1/2 tsp of white vinegar in with it. I used Frank’s™ brand hot sauce for my spice bag. 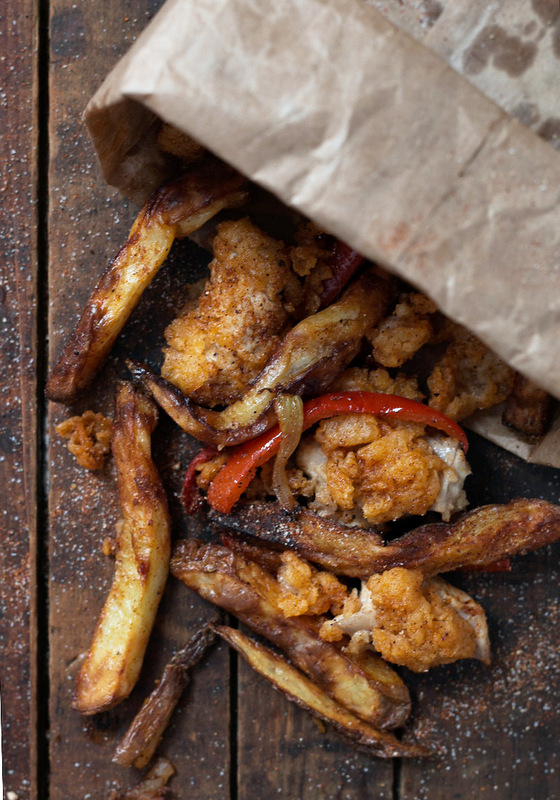 In my research, I have seen “skinny” versions, that skip the breading of the chicken and use oven-baked fries. That’s always an option, but speaking for myself, I’d really miss the crispy, spicy breading in this one, so I’d recommend going all in. 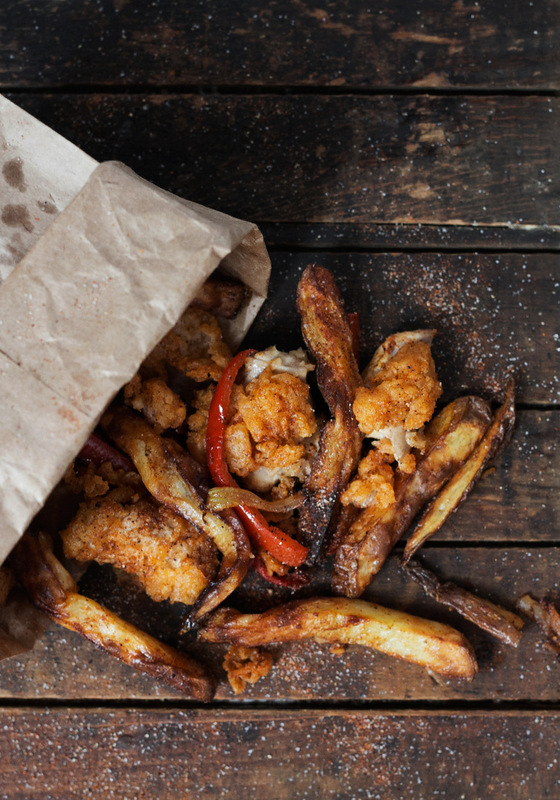 Fries, spicy fried chicken bites and vegetables, all tossed in a spicy salt and served up in a paper bag. Cut chicken thighs in to small pieces, discarding any fatty bits. In a medium bowl, stir together the buttermilk and hot sauce. Add chicken to marinade and let stand at least 20 minutes, or cover and refrigerate to marinate longer. While chicken is marinating, make spice mix by combining all ingredients in a small bowl. Stir to combine well. Set aside. 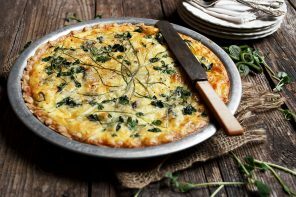 In a large, flat dish, prepare the flour dip by combining the ingredients and stirring well to combine. Take a few pieces of the chicken from the marinade and toss in the flour dip. Return to the buttermilk marinade briefly and dip in the flour dip again. Place on a metal cooling rack, while you proceed to bread all the chicken pieces. When all the chicken has been breaded, heat a 1/2-inch or so of oil in a skillet over medium high heat. Fry the chicken, until golden on the underside, then flip over and fry on the other side. Cook until golden and cooked through. Remove all chicken to a plate. Discard most of the oil from the skillet, leaving just a tiny bit. Return the skillet to the stove-top over medium-high heat. Add the peppers and onion and saute quickly until lightly browned and softened. Add sauteed vegetables to a large bowl. Add the warm chicken and cooked fries. Sprinkle with a generous amount of Spice Mix, to taste and toss well to coat. You forgot Chinese 5 spice in the spice mix that’s what makes it authentic. I haven’t tried your recipe yet but I am making spice bags tonight and I will finish off my spice mix and then try yours. I do know my spice mix tastes exactly like the takeaways here but with mine I know what goes into it. I want to try some of your other recipes the pumpkin bread/cake looks nice. New follower. Interesting! I didn’t see that when I was researching it. Will try that :) Thanks! Wow Jennifer! I had no idea what this was when I first saw it but now that I am clued in, I can easily see this becoming a huge hit in the states. I mean. . .french fries. . .fried chicken. . .spiciness. . .it’s everything Americans love in splurge food. I myself did not grow up on fried food so I find that I am clueless when it comes this cooking technique. . .but I am very intrigued by air frying. I feel like it just might be the type of frying I could possibly handle. I had no idea what an Irish Spice Bag was, thank you for introducing me! It looks absolutely delicious! I’ve never heard of an Irish Spice Bag, but after seeing your beautiful version I’m sold! This looks far superior to any spicey bags I munched on in Dublin! I just want to dive through my computer screen! In my opinion, every pub should give these out on St . Patricks Day! 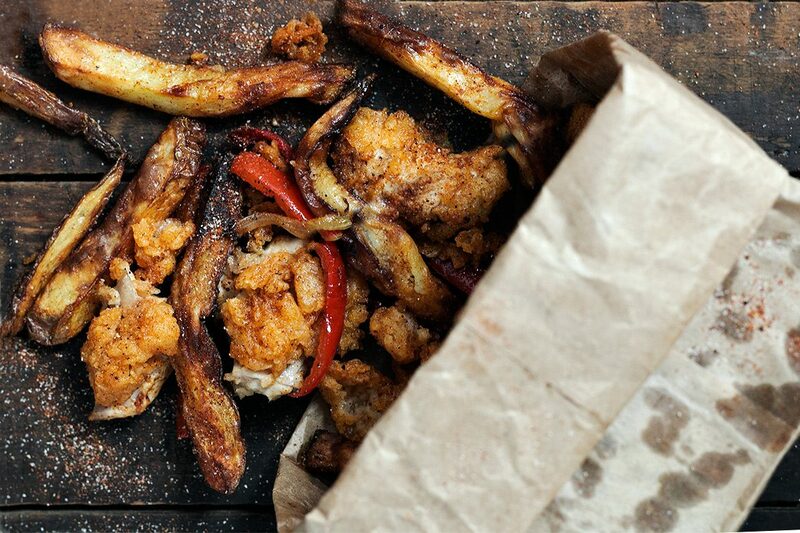 Fried food take-away bags are a must after a day of libation! Obviously I need to make a few phone calls to my relatives, because I’m part Irish and I’ve never heard of an Irish Spice Bag. Clearly someone has been holding out on me!!! These look so beyond delicious it’s CRAZY! Fries, fried chicken AND fried onions n’ peppers!?!? WHAT? This is everything I want in my life! Seriously, Jennifer, you have outdone yourself here! I am drooling!! Can’t wait to try this… immediately! Pinned obviously! Cheers! Thanks Cheyanne and yes, I think they have been holding out on you :) From what I hear, anyway! I have decided to take this post down to my local ‘chippie’ to give them an idea for St Patrick’s Day! You could almost make yourself believe this was healthy?. Can’t wait to recreate this for our St Paddy’s Day celebration dinner. For sure! 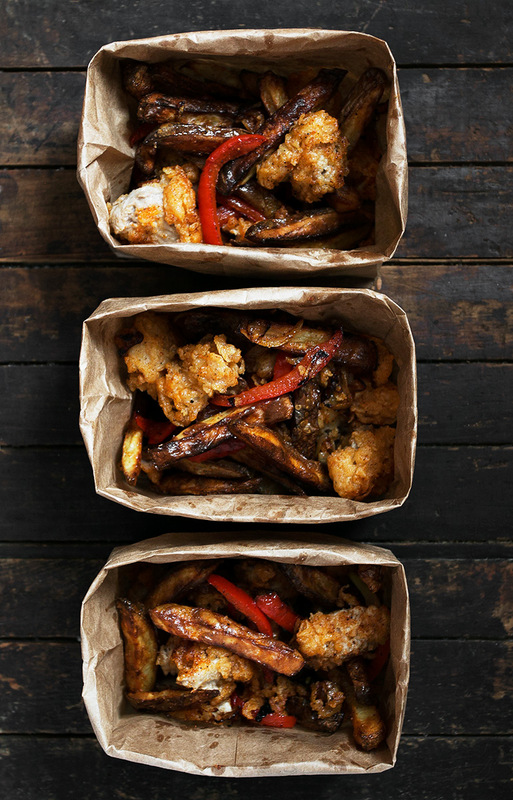 It’s St Patrick’s Day and I made this fun recipe for dinner tonight – in paper bags too. It was so tasty and such fun served in the bags. I now need a trip to Ireland to have the real thing! I think this will become a ‘must have’ for St Patrick’s Day every year now but it may sneak in at other times as well. We are so glad you offered this recipe. What fun! ?? I’m so happy and thankful you did research and found something new for all us foodies to latch onto! I can completely understand why this is the new cool food trend-it looks absolutely amazing! Thanks Meg :) I actually had a lot of fun scouring the internet for all the details on these spice bags! It was a fun and delicious project! I absolutely love this idea, Jennifer… It’s a fun, colorful “something different” idea for St. Patrick’s Day fare that’s sure to be a big hit! And the other #saintpatricksdayfeast2017 recipes? What a fabulous roundup! One-stop Irish Party menu planning at its finest. Thank you! Thanks so much, Michele and yes, so many fabulous St. Patrick’s Day recipes today! OMG! I have not heard of Irish spice bags, but I’m in love! I don’t fry food very often (healthy food blogger and all), but when I do, it’s got to be worth the calories. Your recipe definitely qualifies. 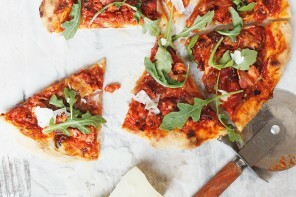 :-) Lovely photos and fantastic recipe! Happy St. Patrick’s Day Jennifer! Thanks so much, Tamara and yes, I’m the same way. If I’m going to be frying, it has to be worth it (and these were definitely!). I’d have to ask for two bags because I would not be sharing. These look incredible! These bags are brilliant! Totally brilliant. I don’t remember ever having something this delicious looking while living in Ireland:) Love the casual presentation, beautiful shots. Thanks so much, Milena :) From what I gather, these spice bags are quite a recent thing – maybe just the last couple of years, but they have apparently caught on quickly! Where has this been all my life?! Seriously. You have outdone yourself, as this is so darn beautiful. Two years ago, I received an air-fryer as a gift, and I didn’t know anything about it. It is actually quite amazing! I don’t know many others who use it, so I smiled when I saw you mention it. Anyhow, I am not Irish, but I would love to grant you forgiveness, praises, and lots of love for bringing this recipe to life. Beautiful. Creative. And Delicious Looking. Thanks so much, Cindy :) I have to confess, I don’t use my Air Fryer for much beyond fries, but when it comes to fries, you really can’t beat it! Infinitely better fries than “oven fries” and so much easier, cleaner and lighter than deep frying. The air fryer earns it keep in my kitchen just for that! I could literally dive into that little bag head first! So glad you went with the crispy spicy breading! Go big or go home, I say!! Well done, my friend! I am so all in for this. Sometimes you have to go for it and these spice bags are it! Love the buttermilk and of course all that delicious crispiness going on. I’ve never heard of a spice bag before so I can’t speak to the tradition, but I can speak to the YUM! Holy moly! Does this look good! After having a beverage or two on St. Patrick’s Day this would be the perfect thing to dig into! I’ve never heard of this before, so where has it been all my life, lol :D Pinning this one! Happy St. Patrick’s Day!! Wow! I’ve never heard of this, but you can totally count me in Jennifer! That spice mix sounds delicious! Thanks Mary Ann. It was a fun treat! My husband would be all over this one! I’ve never tried an Irish Spice Bag but I would if I could :) What a delicious way to be Irish for a day!